Looks pretty cool, huh? That streak of light across the sky is the milky way galaxy. The bright spot toward the right side is the center of the galaxy, which by the way, encircled by an unimaginable number of stars is our very own supermassive black hole. Anyhow...anything you see in the sky that is not a star from our galaxy is either a planet or another galaxy, and we can't see too many of those. There are only 4 galaxies, including our own, that can be seen with the naked eye, and they're all so far away that they look like stars from here. So, almost everything we can see with our eyes in the night sky is, astronomically speaking, pretty darn close by. I'll give you a second. Seriously, stop reading this crap and go back and stare at that picture some more. Looks kind of like a bunch of stars at first, huh? As you look closer you realize that every single one of those things you see is a motherfucking galaxy. A galaxy... As a reference, our galaxy contains around 100 billion stars. 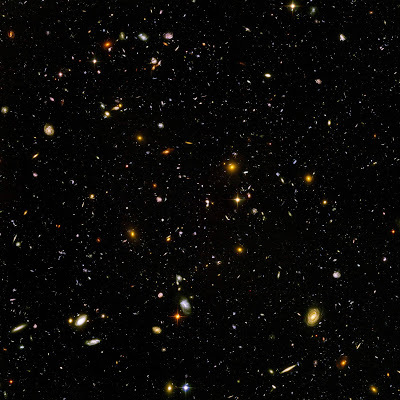 Now try and count all the galaxies in this photo, multiply that by 100 billion, realize that this photo is of an incredibly tiny pin-prick point in our sky, and now make your best guess at how many other colonies of life exist in the universe. My guess is 69. What's yours? As an added bonus to how amazing this photograph is, even at the speed of light, the photons emitted from these galaxies took about 13 billion years to reach the telescope's lens. 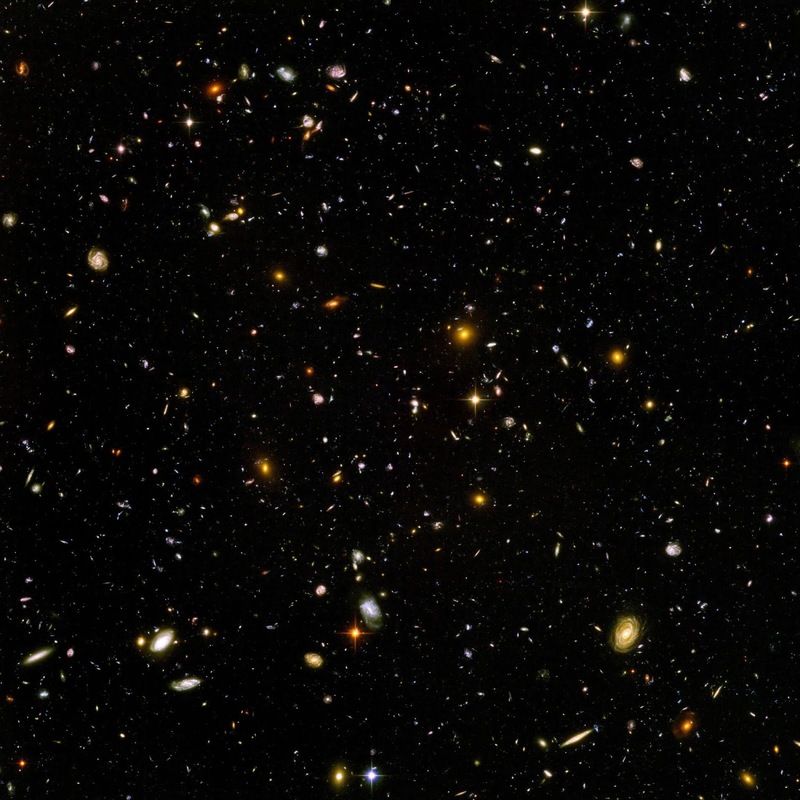 Now, the universe is only around half a billion years older than that, so that means that this is a picture of the universe shortly after the beginning of time. Think about that...the beginning of time...of time...time. time. time. what is time? how could it begin? can it end? how are we moving in time and why can't we control it? who are we? cjh, that is a real "men in black" observation. yes.